HJake (5 years ago) Inappropriate? 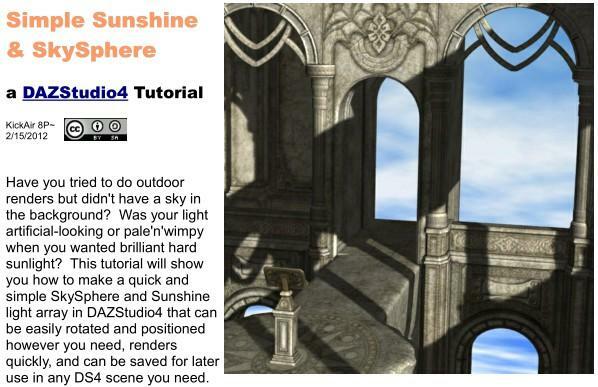 Anyone new to Daz Studio needs this, Doesn't only teach lighting but also teaches program navigation etc! Wonderful and clear work!!! Creator (6 years ago) Inappropriate? Great fun. Thank you for the education. Superior tutorial. kantaro (6 years ago) Inappropriate? I agree with thise below ... an excellent tutorial, and best of all, it really Works! I've had great fun playing with this, after being very discouraged by other lighting tutorials out there. Thanks for your fine work. Indigo (6 years ago) Inappropriate? Thank you, happy to give this a top rating. Excellent tutorial, a lot of time went into this. ZamuelNow (7 years ago) Inappropriate? Very useful. Thanks for releasing this. IrishRose23 (7 years ago) Inappropriate? Thank you so much for a great tutorial. You even give the settings you use for everything. THAT is the way to write a tutorial! I wish every tutorial explained things this well. Are you planning to write any more? You are a very good teacher. Terrific! I could definitely use some great outdoor lighting... and a tutorial to boot! Thank you! Elegh (7 years ago) Inappropriate? MotoTsume (7 years ago) Inappropriate? Highly useful and immensely helpfl tutorial~ Thank you so much for creating this package & sharing it =) 5 Stars! This is fantastic! Especially to save for use on another scene (I found this through DS site). Thank you for putting the tutorial together. Also for the backgrounds/sky. Light Tutorial for DAZ Studio 3!